Welcome to Alumni Spotlight, a blog series focused on our alums – where they’ve been and where they are now. 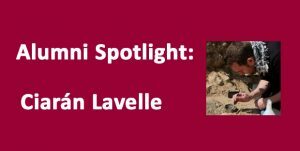 For this installment we interviewed Ciarán Lavelle. I read for both the BSC Conservation of Objects for Museums and Archaeology and the MSc Professional Conservation at Cardiff University. 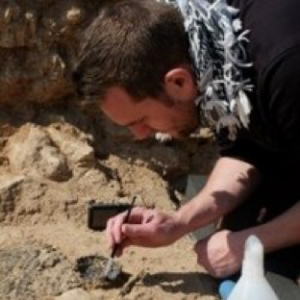 Before starting the courses at Cardiff I had read for a BSc Archaeology and Paleoecology from Queens University Belfast and a postgraduate diploma in Cultural Heritage and Museum Studies from the University of Ulster. In the nearly 8 years since I finished my undergraduate degree in Cardiff I have travelled a great deal in search of work. As a volunteer I participated in 3 Heritage without Borders projects in Turkmenistan, Kazakhstan and Kosovo. I have worked as an intern on an archaeological excavation in Athens for the American School of Classical Studies and as an intern at the Glass Transport Museum. I have worked as a full-time conservator in Bristol Museums; the National Science Museum, in their storage facility at Wroughton; on the Staffordshire Hoard project at Birmingham Museums Trust; on excavations in northern Greece for UCLA and Qatar; and for the University of Wales and University of Copenhagen. 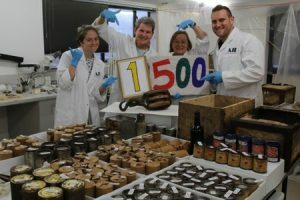 In 2016 I undertook a 16 month contract with Antarctic Heritage Trust which had me working in both New Zealand and in Antarctica over the period of the contract. I am currently working as an object conservator for the Birmingham Museums Trust. 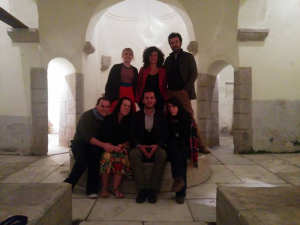 The combined team of Heritage Without Borders and Cultural Heritage Without Borders staff running a conservation training camp in Kosovo. 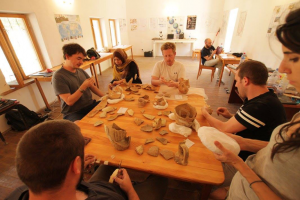 A group of UCL students learning the art of ceramic reconstruction from Heritage Without Borders staff on an archaeological excavation in Otrar, Kazakhstan. My first paid job after I finished university was as a freelance conservator for Bristol Museum and Art Gallery. It was a great job to have got so early in my career as it was to help prepare objects for the new Museum of Bristol project. The objects were varied and therefore I gained a lot of experience working on a wide range of materials with a great deal of independence and responsibility. But that was also a double edged sword as I was left to work and make decisions on my own, therefore could be a daunting situation at such an early stage of my career. Luckily I had a good team around me at times that provided advice and aid where required. A few years later I was also working as the lead conservator for a university excavation project in rural Qatar for the University of Wales. Since this project did not have conservation as part of its operation it was my job to design and implement the integration of a conservation department within the project. In a country where conservation supplies were scarce it was quite a challenge to learn where not just to find necessary supplies but also how and with whom to develop relationships with heritage organisations within the country to aid your project. It was a steep but exciting learning curve and has benefited my career to date. Onsite conservation in Ruwayda, Qatar. There have been a few projects that I have loved being a part of, for example as an archaeological fan boy, working on excavations in Athens and the site of a Macedonian siege led by Philip II of Macedon (father of my childhood hero Alexander the Great) in Northern Greece was a childhood dream come true. Despite this, my time working for the Antarctic Heritage Trust is a firm highlight so far, especially the 4 month period I spent working and living on Ross Island in Antarctica. It was another childhood dream come true (one I long ago filed in the drawer where you put other dreams such as being an astronaut) as it allowed me to follow, albeit in very modern warm polar clothing, in the footsteps of famous Irish explorers Tom Crean and Ernest Shackleton. Helping to preserve the heritage of the age of exploration and the later work of the explorers such as Ed Hilary was a real privilege, as was being allowed the opportunity to physically conserve the historic huts which still stand today as a testament to the explorers’ bravery and the hard work undertaken over the last 15 years to preserve them. Also camping and working in conditions as cold as minus 32 degrees was a once in a lifetime opportunity. 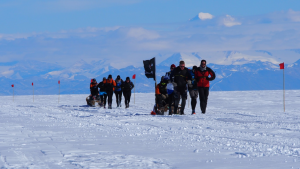 Ciarán Lavelle and his team running a 5km man hauling sledging race during his time working at Scott Base. 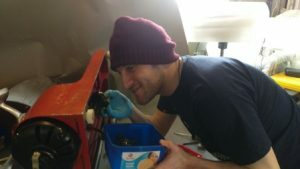 The conservation course at Cardiff was the making of me as a conservator, as that is where I learnt the basics of my craft and more importantly to think as a conservator. The course was also the making of me as a person, as it pushed me to achieve, to learn, to adapt to any situation that comes up in my life and to push myself and rise to every challenge, which at the end of the day has led me to having a hell of an interesting, challenging and exciting decade. The programme was a challenge in many different ways. Academically it challenged me to be more than I was in many aspects of my life: I achieved more academically at Cardiff than I did in my entire previous academic career prior to that, as it pushed me to do better. I also never thought I would publish anything in my life and yet I have due to the confidence the course and the staff gave me to do so. The course and the career also led me to spend great deals of time traveling and working abroad on various projects which equally changed me in ways I can’t even describe and resulted in me experiencing amazing things and meeting so many wonderful people. My education and my career have enabled me to meet and work alongside like-minded people from all walks of life and from all over the world, some of which have become lifelong friends. In retrospect, at Cardiff it always seemed like we were working, 24-7 on some aspect of the course and had little time for anything else. I would have liked a bit more of a break, but I doubt the teaching staff would agree with me on that, haha. I’ve not had too long of a career as yet but I have been lucky enough to have done some amazing things as well as suffer plenty of low periods. So with the experience I have had so far I’m going to throw a few old Irish phrases here which have helped me in the past to make decisions and keep going. When I am trying to make decisions such as what jobs to go for, even if I think I am not quite experienced or ready for them, I think of what my brother says when I ask him if he is coming home in time to have dinner: ‘put my name in the pot’. The second phrase I always think of when I’ve just suffered a job rejection or missed out on something, my old friend Aoibheann always says ‘whats for ya won’t pass ya’. So be positive, work hard, and take chances as most of the time they work out and lead to great things and amazing people coming into your life. 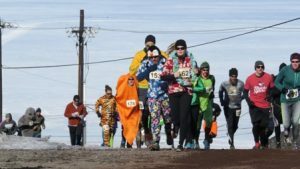 Ciarán Lavelle doing a 5km fun run in minus 20 degrees around McMurdo Station, Antarctica dressed as a carrot. 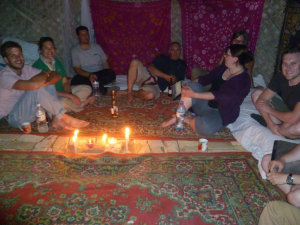 Downtime in a yurt in Merv, Turkmenistan during a UCL excavation. Thank you to Ciarán Lavelle for sharing his experiences and words of wisdom with us. May we all work as hard and achieve our dreams!